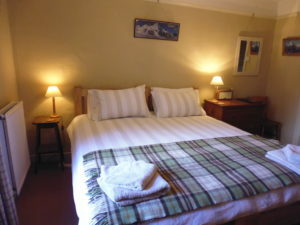 We have three bed and breakfast rooms all on the first floor. 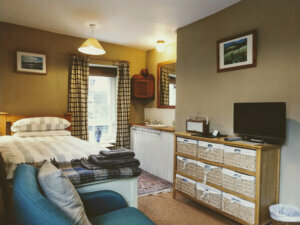 Room 1 is a large en-suite at the front, and Rooms 2 (double) and 3 (twin) share a bathroom at the back of the house. The rooms all have free fast WIFI access, and Bluetooth compatible radios. Children over the age of 8 are welcome, but we are not really suitable for very young kids. 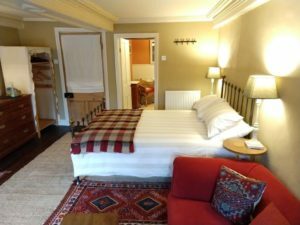 Breakfast – all room rates include a plentiful breakfast of tea, coffee, fruit juice, home made bread and preserves, organic yoghurt and cereals, fruit and croissants. A selection of cooked breakfast options, using the best free range and local ingredients, is also available for a supplement of £2-3 per person. Our bacon and smoked salmon are supplied by Black Mountains Smokery, eggs are free range or organic and sausages are either Free Range or Freedom Food certified (depending on availability). We are also able to cater for Vegetarian & gluten free diets. Click on the room photos for more information. Note that if not available for your dates the room does not appear. Bridge Cafe B&B Brecon Bridge Cafe B&B Brecon updated their cover photo.